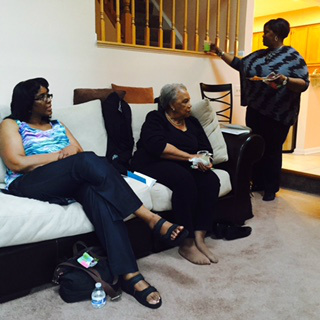 Relaxing during a book club discussion! My name is Sharon Lucas and I’ve been an avid reader all my life. Sixteen years ago when I began to feel overwhelmed with my three full time jobs as wife, mother, and sales manager with a major cosmetic company, I started a book club. Today I am retired, the book club is still going strong, and I’m living my passion as an avid reader and book club advocate, which simply means I read everything I can get my hands on and I support book clubs and authors by hosting events to help close the gap that has been created by the closing of many of our brick and mortar stores. Starting a book club in your community is an excellent way to make friends and extend your reach in the community where you live. Starting an online book club is a great way to stay connected with family and friends in other places. You don’t have to be an avid reader to make this happen but you must enjoy reading! If you don’t have a “book budget” your first stop should be the public library where you can check out a book or download an eBook, and don’t overlook “freebies” on Amazon and sales at dollar stores in your area. Whether your club will meet in person or on line, following a few simple guidelines will get you started: Decide on the date of the first meeting, choose a book, and invite everyone you know, ask friends to bring a friend. If you’re new to the area and decide to start a meet up club, ask for permission to post/put out flyers in the daycare center, local schools, libraries and churches. If you decide to start an online club, pull out your contacts and send an invite to your family and friends around the world and decide how you will meet – via phone, Skype, Facebook, or teleconferencing. Regardless of which type club you choose, preparation is key! Be prepared to facilitate the first meeting, in other words, be ready to guide not only the book discussion but also the discussion on choosing a regular meeting day, the hosting rotation, and the genres of books the members prefer to read. Be prepared to announce the date, time, and book for the next meeting; you can either choose a book or once people confirm they will participate, you can reach out to someone and ask them to choose a book and host the next meeting. There are many great books and authors - but since you have to start somewhere - I direct you to "Forty Acres" by Dwayne Alexander Smith, "Stand Your Ground" by Victoria Christopher Murray, "Mama's Boy" by ReShonda Tate Billingsley, "Grant Hill" by Leonard Pitts, Jr., "Lawful Deception" by Pamela Samuels Young or "The Ex Chronicles" which includes a story written by me. One of these might just be your first book club read.